The, GearWrench Dipped Grip V-Jaw Tongue and Groove Pliers feature positive interlocking tongue and groove design will not slip, rivet joint assembly will not separate, and induction hardened angled teeth for increased grip. The GearWrench Straight Jaw Tongue and Groove Pliers also feature multiple jaw positions for optimized handle span and improved gripping comfort, professional easy-clean dipped grips, clear anti rust coating, and meets or exceeds applicable ASME requirements. The 82064 GearWrench Dipped Grip V-Jaw Tongue and Groove Pliers is one of thousands of quality tooling products available from MRO Tools. 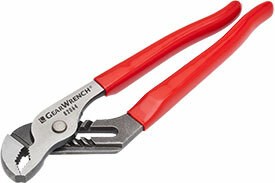 Please browse GearWrench Dipped Grip Pliers for tools similar to the 82064 GearWrench Dipped Grip V-Jaw Tongue and Groove Pliers. 82064 GearWrench Dipped Grip V-Jaw Tongue and Groove Pliers description summary: GearWrench dipped grip v-jaw tongue and groove pliers. Overall Length: 10'' Jaw Capacity: 1-13/16'' Jaw Type: V-Jaw Quantity discounts may be available for the 82064 GearWrench Dipped Grip V-Jaw Tongue and Groove Pliers. Please contact MRO Tools for details.